This post for 9 Easy High Protein On-the-Go Breakfast Ideas was sponsored by Health Warrior. But rest assured, all thoughts and ideas are my own. Protein (along with fat) is crucial for staying full and satisfied throughout your morning. I recommend getting at least 15-20g protein in at breakfast if possible. Not only is protein essential for maintaining (and building) muscle mass, but it’s also crucial in maintaining a healthy immune system. 3) Homemade trail mix- 1/4 cup walnuts, 1/4 cup pistachios, 2 Tbsp raisins, 2 Tbsp chocolate chips- you can make double and triple batches of this and store in an airtight container. Pour the desired amount out in the morning and it’s perfect for eating at your desk or in the carpool line! 4) 1/2 cup plain Greek yogurt, 1 Tbsp nut butter, 1/4 cup pumpkin seeds, 1 cup frozen berries- pack this the night before in a sealed container. Mix it up in the morning and eat on the way to work/school/etc. 8) Overnight Oats- get creative with your flavors, or use these ideas here. Oats are a naturally high protein grain. Combine them with a liquid protein source like milk or yogurt and add in some nuts and pumpkin seeds! 9) Hummus and date sandwich- basically the sandwich version of this toast. I know it sounds a little weird, but I promise it will leave you full and satisfied! 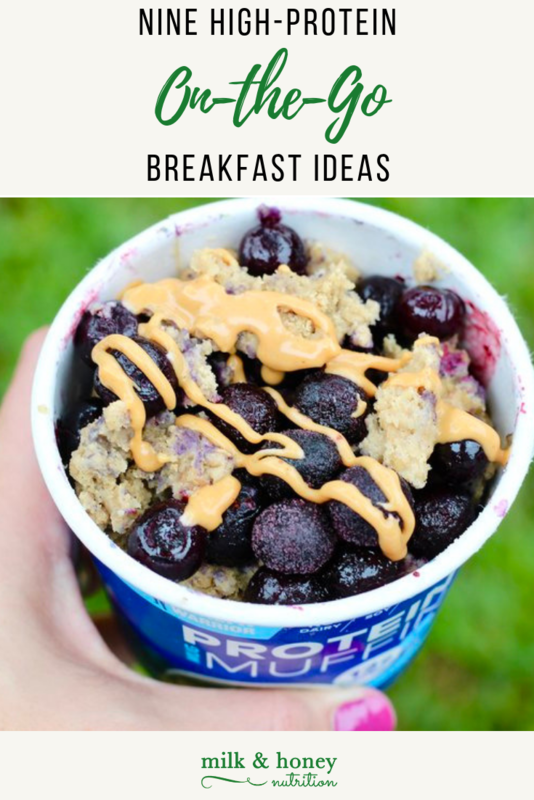 What’s your favorite easy high protein on-the-go breakfast idea? If you’d like to try any of the Health Warrior products, make sure to use code milknhoney20 on HealthWarrior.com. My favorite Protein Mug Muffin flavor is the Peanut Butter Chocolate Chip!